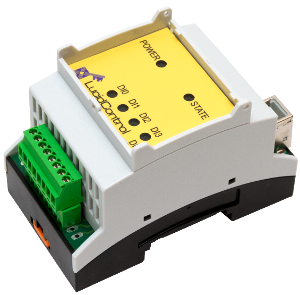 The LucidControl USB DAQ and control modules should be considered at as as being a good decision whenever automation processes are required. The LucidControl products consists of powerful Plug and Play USB IO Modules with outstanding attributes transforming a PC into a digital and analog data acquisition and control system. The flexible USB DAQ and control modules are best suited in order to manage electric consumers including fans, pumps or even valves by capturing and creating analog as well as digital lines such as logic states or voltages. Beside of being very best prepared for many applications home jobs, USB DAQ Modules are additionally engineered to be able to meet countless related specifications of industrial applications such as workbench automation. The possibility of fitting the USB Data Acquisition Modules on common DIN-Rails is just one advantage mentioned here. This specific capability allows the integration of LucidControl USB DAQ Modules into switchgear cabinets of an automation project. The reliable USB DAQ Modules are equipped with industrial standard IO terminals. 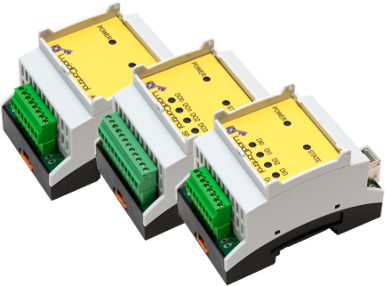 Both, the DIN-Rail option and the solid IO terminals make the USB DAQ Modules a great decision for automation applications and also machine sector. LucidControl USB DAQ Modules are portable and additionally they work with various operating systems like Linux and MS Windows. Due to the standardised driver, which is offered in most current operating-system, out of the box installation can be performed very easily within minutes. The devices work with the popular and impressive TIs Beagle Bone and RaspberryPi® single board computers. The creation of web and smartphone software are usually simplified by using these kind of computer boards. 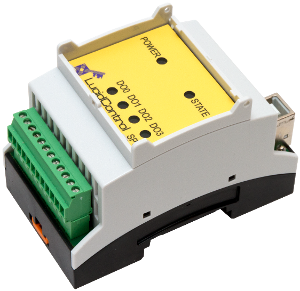 All LucidControl USB DAQ Modules can be handled by using the same user friendly software which makes working with the units quite simple. As soon as an unit is present at the Universal Serial Bus port of a computer it starts working immediately and all USB DAQ Modules are supposed to be controlled with the identical user friendly program which makes managing these units really easy where it is not important how many devices may be connected to the single computer. Making use of the available command line application, the Python and Java® Software development kits offer complete utilization of all functionality of these USB IO modules. The USB DAQ and control modules versatile for many automated projects. Almost everywhere where lines are managed e.g. within the factory floor automation section, the devices can be used to handle electrical loads such as fans or lawn sprinklers. 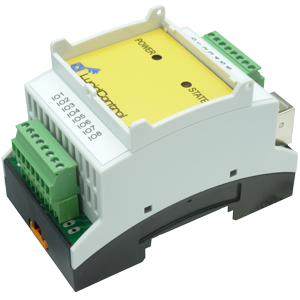 Standard applications such as designing a time switch or even more complex automation tasks like scaling and monitoring of temperature or humidity can be achieved straight forward by employing LucidControl USB IO Modules. Since the USB DAQ Modules are able to quantify environmental inputs such as humidity and temperatures, LucidControl USB IO modules are also specialized in power management applications. Clocked outputs in addition to standardised analog 0-10V interfaces can easily generate lines for managing valves, mixers and pumps of a central home heating managed by computations depending on quantified temperatures. In the building sector these reasonable priced LucidControl USB IO modules can be used to regulate creating for example different illumination surroundings. Not to mention that all these solutions are just a small number of ideas and they can easily be handled remotely over the Internet by employing a smartphone. After a LucidControl USB DAQ Module is connected to the Internet there are actually no limits in applications. Our companies goal is it to provide LucidControl USB DAQ Modules with many different interfaces in order to make these products prepared for all applications. Typically, LucidControl is founded on PC technology and it works together with most computer systems running Linux and Microsoft Windows®. In the last years, micro-sized computer boards such as the Raspberry Pi as well as the TI Beagle Bone Black became widely known. These small computer boards offer USB interfaces and permit to connect of keyboard and display. Due to the Linux operating system these computer boards are able to solve plenty of jobs instantly. Many software applications like popular Internet servers as well as database systems can help you, can be found on the Internet and can be downloaded. After a Web server had been setup, the IO unit is worldwide reachable with all its features remotely secure by browsers. Measuring and logging of gained information as well as events is possible at low work by using a reliable database system like SQLite. You’ll find so many sample programs supplied explaining the use of LucidControl USB DAQ modules. In order to make the setup of LucidControl USB DAQ modules simple, a large and continuously growing software bundle is downloadable. Not to forget that all functions are described very well and guides offer useful understanding providing fascinating tips for various applications. An instant start is the LucidIoCtrl command line tool that works with all LucidControl units and it is the perfect selection to configure and control the devices without a single line of coding. Giving entire access to the modules and being available for most major operating systems without requiring installation, it saves development time and additionally improves the time to market. The command line tool is ideal suited to develop portable applications that are essential for internet accessibility easily. Popular programming environments like Java® and Python are supported through the API. Additionally, the modules are thoroughly explained with nothing being excluded or kept hidden allowing development of new ports for other software development languages or supporting other computer platforms. We not only the representative of the LucidControl IO products, but the designer and furthermore manufacturer and we use them for our personal tasks. It is our objective to make the first steps into the the LucidControl IO environment as easy as possible but when you’ve got any difficulty which you can not solve on your own, we will help you as good as possible to find a solution. The hardware as well as the software have a consistent and modular approach which is clear developed and extendable. On clients request we can create value-added add-on extensions offering extra functionality without changing the basic concept of a LucidControl USB DAQ module. Because of the flexible and upgrade able software, functionality can be implemented and changed in the field easily what protects your investing in the future.